Simplicity and convenience are two key factors why we ‘distance shop’ in the first place. Many retailers recognise that making a returns procedure difficult will seriously reduce the chance of future orders. They no longer view the inclusion of a Returns Label as a way of encouraging returns but more to assist the customer should a returns be necessary. As a result more and more retailers are keen to provide a ‘Returns Label’ which can be removed easily from the form and assist the returns procedure. Many online retailers still employ a difficult and cost incurring returns policy and this is why. In order to make a return you need to either call a telephone number or send an email to begin the returns procedure. The company then needs to either answer that call or reply to the email. Many retailers ask you to create your own label and cellotape it to the box which can take up your time! Why as a customer would you need this hassle? 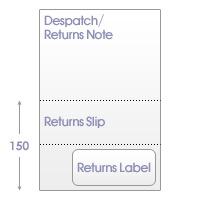 When a returns procedure is made, the customer is asked to return the Despatch Note/Invoice with the goods. A returns section is usually present on the reverse of the form which the customer is asked to complete. The ‘reasons for return’ help to complete the section, but if the customer returns the form, what are they left with as a proof of purchase or valid receipt? Some retailers have adopted a small box (to be ticked) if the customer requires their copy to be returned, but this can again cause additional cost and time problems. Very recently we have produced test packs for a number of multi-channel retailers with an extra horizontal perforation on the sheet at approx 150mm from foot as well as the perforation above the returns label. This creates a ‘returns slip’ that can be detached and returned while the customer keeps the Despatch Note / Invoice as their copy. See the illustration above. We have sample forms available if you would like to see a copy or run a test.